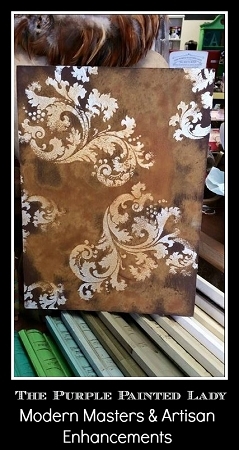 If you love that rust look we create- then you need this product. This is the 16 ounce Iron Reactive Metallic Paint by Modern Masters. AND....you will also want to get Hydrogen Peroxide out of your medicine cabinet. Remember- you need to create an edge around the perimeter of the surface you are painting as so to contain your liquid from this this process. It is a bit sloppy and if you do not create a small, "dam" on the edge with your Modern Master Primer paint- you may want to try creating a lip using paintable caulk - something like DAP Alex Plus paintable silicone caulking that dries clear. This will also be necessary if there are any cracks n your surface. Like- if you have an old dresser. 1. You will want to apply 1 or 2 coats of the Modern Masters Primer. (we sell it here on this site) Brush or roll the primer on and then let it dry thoroughly. 2. Next, you will apply the Modern Masters Iron. Again- you can brush or roll - then let it dry. It is totally fine if it is thin. you will be applying a second coat. Remember - if your iron is too thin - the rust will not be bold. This may be okay with you - but you will want to experiment. You can use this thickness to your advantage by layering the iron on thick and thin to create a different effect. 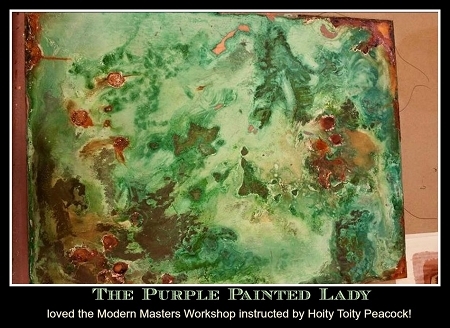 Apply the Modern Masters Iron over your copper by splattering it on as shown in a photo below - and then ........ 3. Apply Modern Masters Rust Activator. Brush by lying on or "mopping", roll or spray. Apply another coat as this one soaks in if you want the iron to rust more. NOW, let all of this liquid dry on its own! This could take overnight if you applied a lot. Where the activator "pools" you will get more yellow and orange in the color. Having variation is a very cool look- so try to not create one huge lake. A. Use a stencil and apply using chalk paint® or some Artisan Enhancements Pearl Plaster (as shown in one of the photos below) to create a pattern. 5.Finish with applying a coat of the MODERN MASTER CLEAR PERMACOAT X-TREME MATTE. This will prevent rust rubbing off onto your hands or your clothes.